I feel so cool and trendy right now because this is a review of a poke restaurant! That’s right, Jon and I were invited to dinner at Ahi Poke in Fitzrovia, London which exclusively serves up the super trendy raw fish salads. 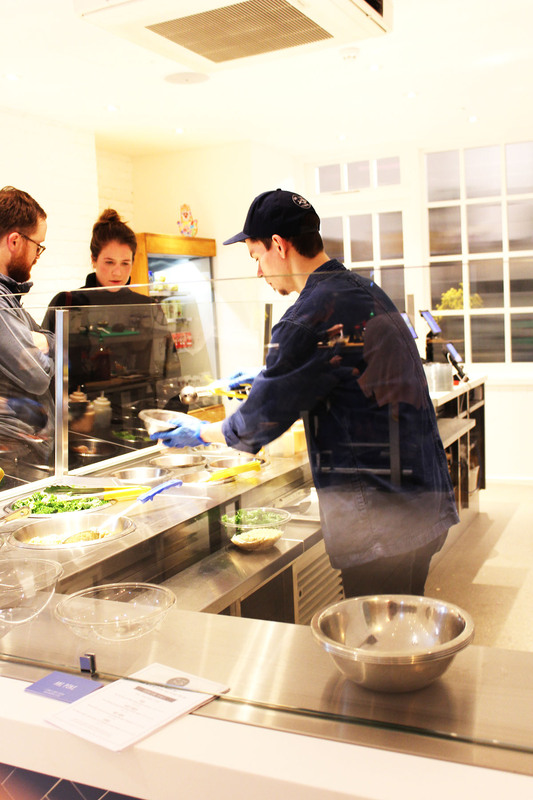 Located on Percy Street, just a stumbling distance away from the hustle and bustle of Oxford Street, Ahi Poke is the perfect place to grab a quick bit to eat that is not only delicious but nutritious too. Oh, and you’ll get serious instagram points if you share a snap of your salad too! Pronounced POH-kay, poke is a Hawaiian raw fish salad and the principles are simple: start with a bed of rice (or perhaps quinoa if you want to be bang on trend), top with fresh and pickled vegetables (pineapple and grapefruit work too, or why not avocado) then finish with your seafood! The best way to describe it is probably that it’s a hybrid of sushi and ceviche (two of my favourite things) with lots of extra tasty toppings. Traditional poke seasonings have been heavily influenced by Japanese and other Asian cuisines. I was initially a bit surprised to see soy sauce on each of the tables but ginger, soy, spring onions and sesame all add to the heady mix of flavours in a bowl of poke. It appears that migrants from Japan, China, South America and the Philippines have all had an influence on the makings of this vibrant salad. If you’re not brave enough to have a go at building your own bowl then Ahi Poke have a couple of choices on the menu to get you started. The signature bowls are the “Oahu“, “Sweet Green“, “Heat Wave” and “Venice“. After trying and failing to pronounce “Oahu” I opted for the “Venice” with extra pineapple and some crispy onions (if in doubt always add pineapple and crispy onions!) 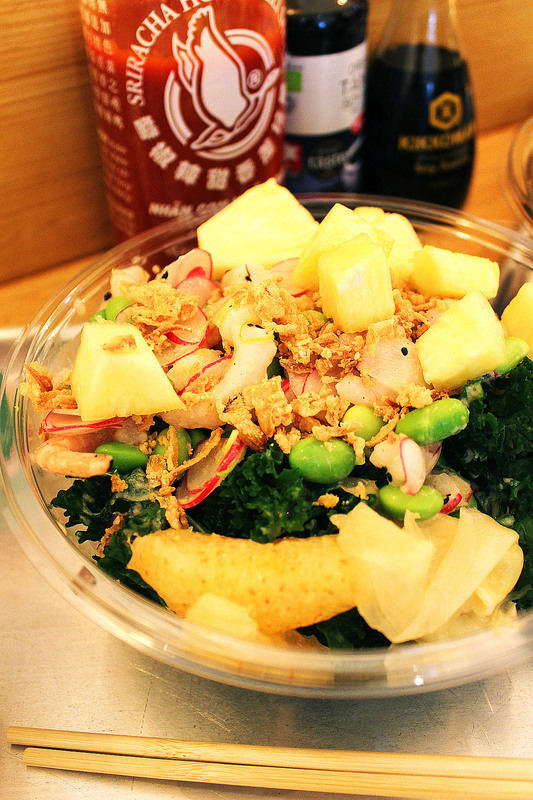 The bowl was expertly layered with kale, quinoa, prawns, cashew nuts, chili grapefruit, edamame and radish. It was then tossed together with a leche de tigre sauce. Now I’ll be the first to admit…I had no idea what a leche de tigre sauce was but it tasted amazing. A little Googling taught me that there’s no one way of making it but it most definitely involved copious amounts of lime and garlic. Happy days! Being the token veggie Jon opted for the Sweet Green bowl. Although poke is all about the seafood, I loved that one of the four signature dishes was vegetarian. These salads are so fresh, vibrant and healthy, it would be a shame to make the vegetarian option “off menu” or only available by asking for the seafood to be left out. The Sweet Green bowl cam with kale, mushroom, edamame, confit ginger, radish and carrot all tossed in a sweet ponzu sauce. Jon was initially a little disappointed his didn’t come with any grains (he realised when it was too late to ask) but did concede he was full by the end so didn’t really miss them! In fact I struggled to finish my “large” bowl and next time would probably get the smaller size. It’s not often I can say I’m satisfied by a salad! If you still have room you can always opt for pudding. 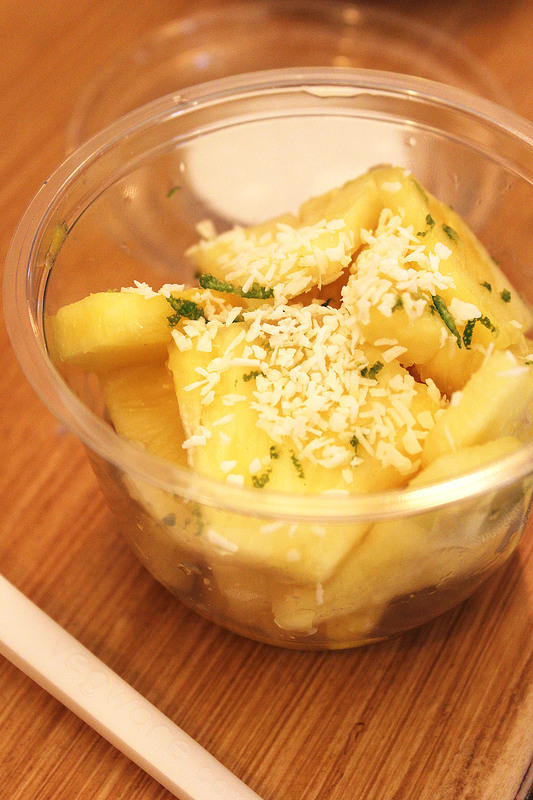 You can choose from virtuous pineapple marinaded in a sweet sticky sauce with lime and coconut or a cookie. No surprises Jon opted for the latter! Once of the things I love about Ahi Poke is that all of their fish is sustainably caught and their veggies are sourced locally whenever possible. They try so hard to only serve the best they can that this does mean the menu is somewhat subject to change. If it doesn’t meet their standards then its just not going to be served! What was really refreshing was that this passion to only serve the best had been passed on to the staff. I spoke to one lovely gent behind the counter who loved working at Ahi Poke. He’d previously worked at a burger chain in the capital and had become really frustrated with the poor quality ingredients and unhealthy food. He was so excited about serving poke and his excitement totally rubbed off on me! I’d massively recommend a visit the next time you’re in the area. And if you become a die-hard fan, like some of the people we saw getting their loyalty cards stamped, you can also order a salad through Deliveroo! See, you don’t even have to leave the comfort of your sofa, there’s no excuse not to give it a go. All in, we really enjoyed our visit to Ahi Poke. It’s only small but it’s got a lovely vibe about it. It’s so bright and colourful, and the food is so good you’re guaranteed to come away with a big smile on your face. Have you been to Ahi Poke yet? Let me know what you thought in the comments below. Sounds like a really trendy place! Great to hear they have a tasty veggie option as well, I never understand why some restaurants don’t offer at least one veggie choice! I really like the idea of poke but the last one I tried from a UK chain was so awful I have been put off. I need to get to Ahi Poke to turn that around again!